Hi all, very very long time no see I know, life is so so busy and I didn’t get much time last summer even though I took several photos just didn’t get around to sharing, then there has not been much garden-y stuff happening so far this year. Hi Pamelaanne life is just so fast these days isn't it? its a beautiful orchid what a lovely colour too. Do you know which species it is? Wow, that is really stunning - beautiful markings. 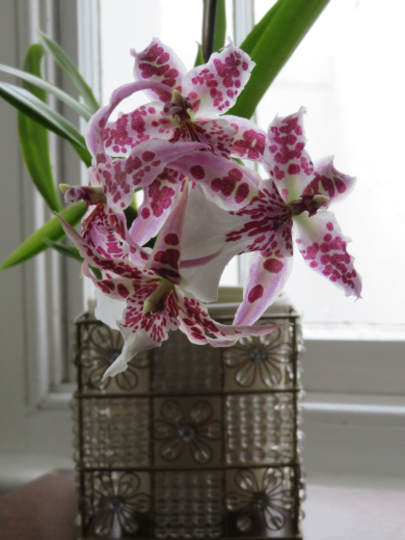 Seeing it reminded me that it's the orchid festival at Kew Gardens soon so perhaps I'll go. I have no idea what variety it is, sorry Seaburngirl, just something I picked up at a local charity shop so no label. Ginellie, I hope if you go you'll have a fabulous time. Its a very dramatic one- enjoy! 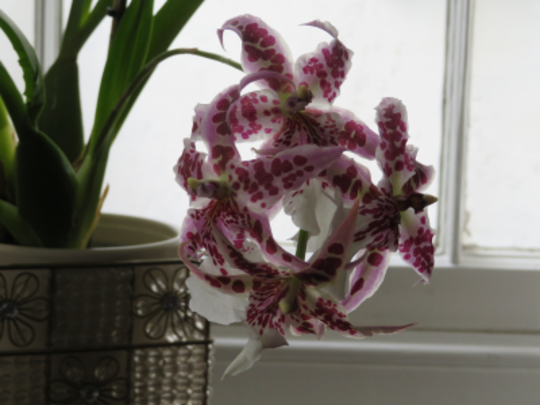 Also was a half price orchid – the instructions are different to the one I already had which requires a morning soak for an hour each month – this one just requires watering like any ordinary plant so will be easier to care for. As far as I can tell, it was only reduced because the flower had died off (just like my other one was and it’s been beautiful since). The information also tells me that when it’s flowering, it’s scented. I love nice scents so I will enjoy that when it does, as well as it will be a lovely surprise to see what colour it will be. The label tells me the name is Cambria. 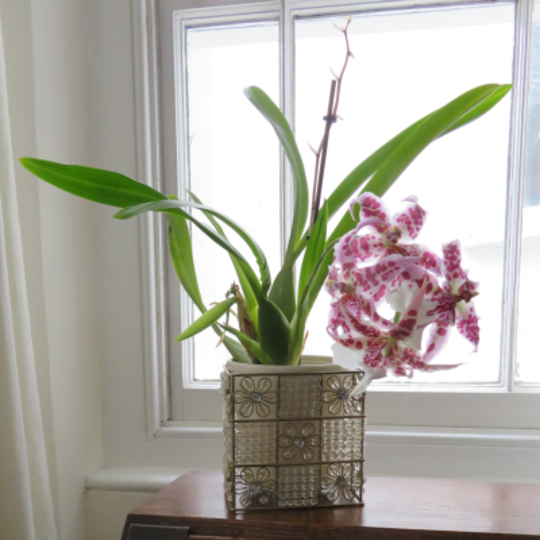 Its leaves are upright, unlike my other orchid which they go sideways at the bottom of the pot. So they are quite different from each other." I don't know where the label has gone now though.... otherwise I would have known the type etc before finding the old blog! Yes I talk to them occasionally. Sometimes "Come on now, make an effort" , or "Oh that's beautiful", occasionally "Oh sorry!" and on one memorable day "If you don't flower next time you're for the compost" - and it worked -its flowered well ever since! Eirlys - that took me right back - was it Neddy Seagoon?